Coughing is one health condition we have encountered at least a dozen times in our lives. Some people even go to the extent of using various remedies and treatments available in their quest to relieve their cough. However, there are many misconceptions and non-scientific practices in the treatment of cough, which may even prove detrimental to our health in the long run. One popular practice is eating hot soup to help cure coughs and colds. While this practice does help soothe an irritated throat, it does not, unfortunately, help cure one’s cough. As BPI celebrates its 160th year in the banking industry, they made another innovation to bring finance management into a new light and technology. On April 26, they introduced Investment 3.0. With the convenience of the internet and the security of its servers, this makes investors aim for great future stability with the help of Investment Councilors always available. 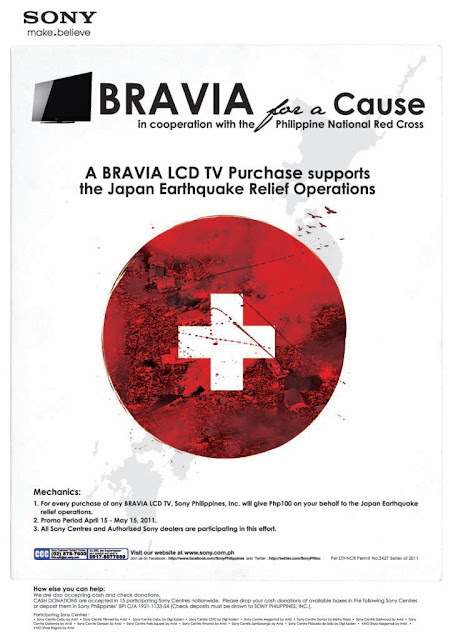 This will run from April 15-May 15, 2011 – For every purchase of a BRAVIA unit, Sony Philippines will give PhP100 for the Japan Relief Operations. Other ways to help is by dropping cash donations at Sony Centres or depositing donations in the specified Sony account. MUSIC LYF: K-POP time, its 2AM in Manila! K-POP Mania is alive this month with another band coming to Manila this April. 2AM famous for their songs like "This Song" and also won their first Mutizen at Inkigayo for the song, "Can't Let You Go Even If I Die". 500 Peso Deals – Free iPad 2 Raffle! What more has Noy-Ni got for the Noy-Pi? Plenty, if you sign in to get updates from www.500PesoDeals.com, which starts boosting your bucks May 13! Can one Ninoy bill actually get boosted to twice its value or more? And can the same deal possibly score you a sweet iPad 2 – yes, the same gadget that got sold out all over the world on the day after its release? Oh, yes it can. All these and more are what savvy Pinoy shoppers can look forward to with 500PesoDeals.com. Unlike other group-buying sites, though, with 500PesoDeals, what you see is what you get. A single P500 – no more and no less - can buy you entry into the hottest events and parties, a meal at the best restaurants, and a seat at the coolest experiences all over the country. And for those who have premium budgets in mind, check out our Super Booster deals – huge savings on very high-ticket items with up to 80% off! But make sure to get the deal early – Super Booster Deals have limited quantities! MUSIC LYF: French Singer-songwriter JULIEN DROLON, Sings Pinoy. While other Filipino bands and singers are trying so hard to be like other Asians just to join in the bandwagon, it surprising to see a European, particularly French, to take his music and immerse himself into the Philippines. And he launches a new single perfect for this summer. Singer, songwriter, and former International Reporter are all words that can be used to describe Julien Drolon, but they merely scratch the surface. Drolon (born in Nantes, France on the 5th of February 1982) is on a mission to promote peace thru his love for music. He first arrived in the Philippines last 2007 and came back at the end of 2009 and decided to start his musical career. Take a Break at the Electrolux Mobile Spa! HALSA, its a Swedish term for health and with the elements getting more harsh and pollution levels rising in our world, we do need to think more of our health and wellness as it is our most important wealth. 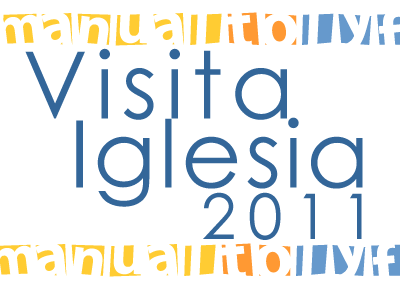 And with the holy week, we would also encounter a lot of stress sometimes more than the vacation that we plan to. This Holy Week, have a new reason for your gas station stop over. Not only you can recharge fuel, take quick nap or buy snacks, but now, you can also avail a free massage treatment from Electrolux Mobile Spa. Its also Good Friday, a day of reflection on how Jesus Christ showed his love for all by offering himself on the cross even though we have sinned. This day also tells us that our Mother Earth has also cared for us providing with all that we need in life, but in return, we pollute and destroy her wonders. The message: we must repent our wicked ways and rebuild ourselves into what we are called for, stewards of nature and to be a holy and righteous people. My two cents for this day. Reflect. Renew. 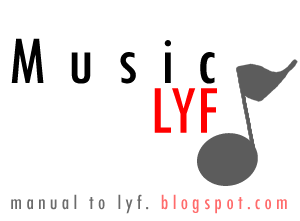 Rediscover LYF. the whole story very soon, stay tuned. LAKABYAN: The New Rizal Park! More Attractions Coming Soon! If you were born before the turn of the Millennium, you might have spent leisure time not inside the malls but parks like Luneta.These were the original places of travel and fun. These places were the most "in" back in the days but with the age of malls and the rising crime rate at parks caused the demise of these parks especially Luneta. We know that upon this place, Jose Rizal, the national hero, was sentenced to death by firing squad on December 30, 1986. His remains was initially placed in Paco Cemetery but was transferred back to Bagumbayan and was named Luneta because of the cresent shape which in french is called lunette . When I was young, our family does go here, but there were a time that my mother was victimized by a pickpocket which made me look at Luneta as a place of crime and homeless people. BLAH BLAH BLOGS: Summer Specials! Yes! 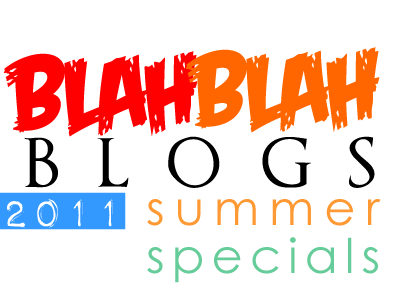 its officially summer, as declared by PAG-ASA and we open up summer with another edition of Blah Blah Blogs 2011 Summer Specials! And as things are getting warmer with the weather, the happenings in the country are also getting hotter. One of which is today is also Komikon Summer bayanihan at Pasig. The premiere pinoy comics convention is moving to the Bayanihan center from UP Bahay ng Alumni.I would also sell my comics there, unfornately, my new release would be delayed due to financial constraints. However, better enjoy the moment! There is also the Blogger fest happening at Thunderbird Resort in Rizal, over 200 bloggers will be there, of course minus myself and as of this writing some cannot sleep because of excitement. Some would also go to the Firefox 4 launch in Makati. And to cap the day, The Script will perform for just one night. I wanna go there! Venus Raj from Binibini candidate now goes into major major changes in life as she herself is now very busy with schedules and endorsements given to her even after the Ms. Universe pageant and as she passed her crown to the new queen. She has gone into a transformation from probsyana to a world-class beauty queen and as a continuing role model for the Filipina today. Her life is one filled with television appearances, photo shoots, and media events, not to mention possible career opportunities. This is what is happening to Venus right now. The demands of her blossoming career have entailed her to sport various looks to suit different roles. But beauty does pay its price. “Too much styling, using the curling iron, using the flat iron, rebonding really takes a toll on your hair,” says Moussa Abdayem, technique trainer and head stylist of Emphasis salon. 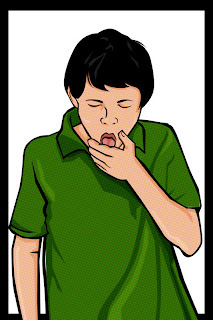 Coughing is a reflex that serves several functions. It helps protect the lungs by clearing airways of secretions and foreign particles. In most cases, coughing may also be a symptom of an underlying condition or illness. How would you know if your child's cough is simply a case of the body doing its job, or a sign of a more serious ailment? It all depends on the type, character and severity of the cough, and how long it lasts. Basically, there are two types of cough : productive and non-productive. Productive cough is usually due to a viral or bacterial infection. This type of cough expels the phlegm which was formed in our respiratory passages so abnormal amounts of mucus and germs are eliminated from the respiratory tract making breathing easier. 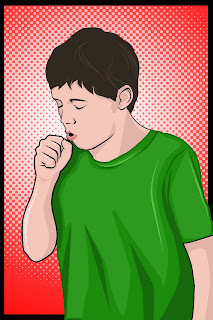 This type of cough is commonly seen in asthmatics where it is accompanied by “wheezing” sounds due to constriction of the respiratory passages due to infection, fever may ensue. Summer is bound to get hotter as Sony Philippines introduces its new roster of Cyber-shot and Handycam models and accessories. With these new offerings, embark on a summer to remember as you dare yourself to go out on a limb, explore new places, chart a new adventure, and do something you have never done before. 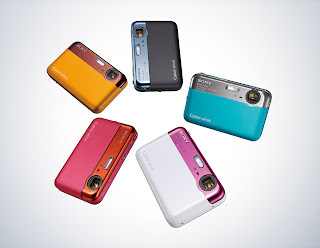 Add sizzle into your summer with Cyber-shot Never before have innovation, style and the most advanced technologies come together than with today’s introduction of several new Cyber-shot digital still camera models. Choose a design and technology that suits you best and get a roster of new Sony technology innovations that will surely make your summer hotter, brighter and greater. 1. Bigger zoom with less blur with Cyber-shot HX Series as it features a high-performance G Lens with powerful 16x zoom range with 24mm wide angle to accommodate virtually any photo opportunity. Its shooting options include 3D Sweep Panorama, 3D Still Image, and Sweep Multi Angle. Here we go! And the best part is you can choose your prize! Just remember to follow the rules and you won't get lost! This is one way for thanking you for being part of Manual to Lyf! 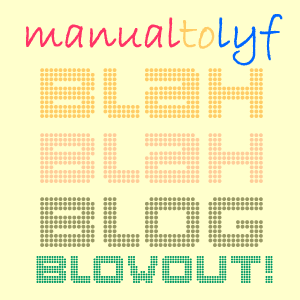 Are You ready For The Blah Blah Blog Blowout? Yes, you heard it right! Manual to Lyf will have its first Blog contest and it will be grand, but of course you have to stay tuned for the mechanics and the duration! So subscribe to MTL now via networked blogs or via e-mail! KIDS and adults alike are susceptible to cough and colds during the rainy season. Since most of them stay indoors when there’s a downpour, there is a greater risk of them getting sick as well as spreading the cough and cold virus. It’s a good thing there is ASCOF Lagundi -- One family in particular has discovered its ease and effectiveness in addressing cough symptoms. The Co family from Muntinlupa is made up of daddy Hans, a bicycle shop owner; mommy Cherie, who is a pre-school teacher and part-time businesswomen; and their three daughters, Samantha, 10; Sabrina, 8; and Sophia, 4. “The rainy season brings a lot of sickness like coughs and the flu. 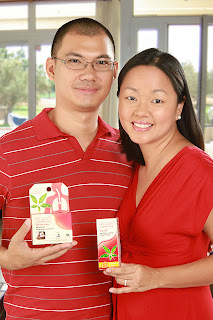 Luckily, we learned about ASCOF Lagundi, which is the cough medicine of our family,” says Cherie. Hans adds that he and his wife have always been meticulous with the type of medicine that they take and give to their children. Enjoy LYF With The Things I Can Do With The SAMSUNG SMART TV! WOW! this is my initial reaction upon seeing the new Samsung SMART TV that was displayed during iBlog 7. And looking at its design unimaginatively thin dimension. And that is only just the tip of the iceberg on what it specifications and features. As flat TV is gaining popularity in this new decade, the clamor for a TV that can do more than airing shows and be used as a video output for players and consoles. And surprisingly, Samsung has come up with the Samsung SMART TV series. Like I mentioned it was featured in iBlog 7 bloggers' convention at UP. And with the audience saw the TV, eyes were very glued to the SMART TV and almost diverted the attention from the speakers. Definitely everybody wants it, even me.